The Ghostbusters team of 2016 joins the mini-mate family! 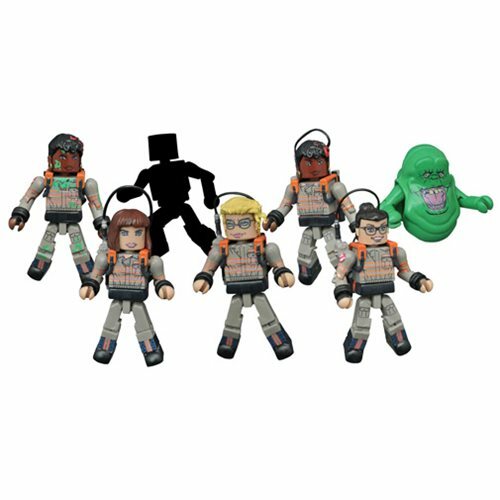 Featuring 4x 2-packs, Series 1 includes Erin Gilbert with Jillian Holtzman, Abby Yates with Rowan's Ghost, Patty Tolan with Slimer, and a rare, one-per-case set of Slimed Patty with a mystery ghost! Each Minimates mini-figure features up to 14 points of articulation and fully interchangeable parts. The Ghostbusters 2016 Minimates Series 1 2-Pack Case includes 12 individually packaged 2-Packs.